Shortcross Gin is distilled on a 4501 bespoke copper pot stil, slowly distilled then hand bottled, dipped in wax and hand-signed and labelled. Shortcross Gin is inspired by the rich lush grounds of the Rademon Estate, right in the heart of County Down. Wild clover, elderflowers and elderberries are foraged on the estate, to give aromatic and floral notes, apples crispness and sweet juicy hints. The recipe for Shortcross is a well-kept secret, but be assured all the typical botanicals like Juniper, Coriander, Orange and Cassia are alive in every sip. The final, and perhaps most important ingredient, is pure fresh spring water drawn from the historic well at Rademon Estate. 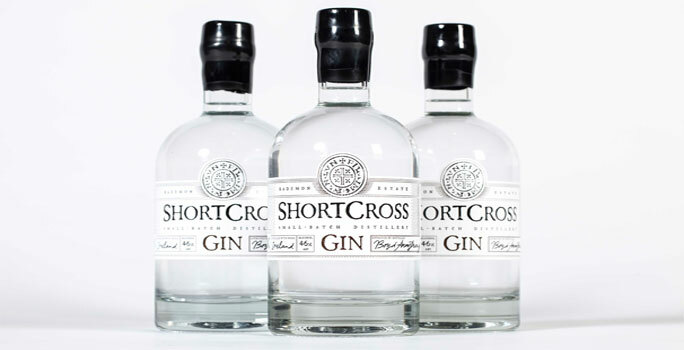 Shortcross Gin is a truly artisan crafted product that reflects its place of production. It makes the perfect classic G&T, served with ice and a slice of orange with the best quality tonic water. Or use it as a base for the many Gin cocktails, that are now so popular. Since 2014 the team have worked tirelessly to promote awareness of the brand and fortunately they have seen increasing interest from international partners wanting to import Shortcross gin into their countries and they now successfully export to 10 different countries worldwide. Rademon Estate Distillery is also proud to be able to introduce new international gin fans to Shortcross as well as being able to give fans from closer to home the chance to enjoy their favourite gin abroad. The recognition received in multiple international spirits awards and in 2017 they were awarded the Gold Medal at the World Spirits Awards in San Francisco. Tourists leaving Northern Ireland can purchase Shortcross at World Duty Free across all UK and Irish Airports, this has boosted awareness and recognition of the brand both within the global gin industry and to new customers. The new state of the art visitors centre overlooking the estates’ rolling hills, entertains public tours and corporate events. The space which is fully licenced indoor and outdoors, offers a wealth of scope for bespoke events from meetings, private dining and receptions. Experience the ultimate Gin Tour with a warm welcome, a tour and talk with the Head Distiller, a Gin & Tonic Masterclass with the brand ambassador. They are proud to be enticing more overseas tourists to County Down and working with other local producers in the area to create fabulous food and drink experiences. These tours have been going from strength to strength and they have another 40 planned for the first 6 months of 2018, for the coming tourist season. Over the past year, they have been gradually building up a corporate clientele, nationally and internationally. Rademon Estate Distillery is the leading craft distillery in Northern Ireland Rademon Estate Distillery is situated on one of the oldest estates in Ireland and is only a 30 minute drive from Belfast City Centre. One of Ireland’s leading distilleries producing innovative, premium spirits for the disconcerning consumer, this stunning estate in County Down is home to the award winning Shortcross Gin and Single Malt Whiskey. Available across the island of Ireland in all great establishments, World Duty Free Airports, Aelia Duty Free, Dublin Airport, Fortnum & Mason, Celtic Whiskey Shop and O’Briens. Available online via jnwine.com. Rademon Estate Distillery Shop and at notonthehighstreet.com.